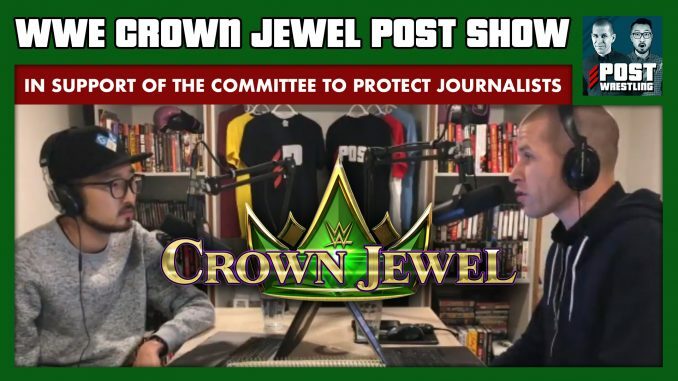 John Pollock & Wai Ting present a special live POST Show immediately following WWE Crown Jewel. Beyond discussing the results of this event, we conducting in-depth interviews about the various issues surrounding WWE’s involvement with the Kingdom of Saudi Arabia and the murder of journalist Jamal Khashoggi. For every minute of this broadcast, POST Wrestling will donate $5 towards the Committee to Protect Journalists (https://cpj.org/). Plus, your feedback from the POST Wrestling Forum. You can WATCH the unedited archive of our live video stream below.